Snapchat has 166M daily users and an engaged audience that is in the prime target for your property. Millennials are using Snapchat at an increasingly growing rate, and using it often. They’re sharing and viewing content that they care about, which makes it the perfect platform for effective advertising directly to qualified leads. Instead of just using the geofilter, which is based on location only, brands can target users based on their interests, time of day, gender and other variable data. Filters are one of the primary reasons users love snapping photos and sharing them with their friends. In fact, more than 3 billion of filters are viewed each day, according to Snapchat. Quaker Oats has already tested out the new advertising feature. The breakfast brand created a filter that targeted mothers and working professionals and switched up the message depending on time of day in which it was sent out. 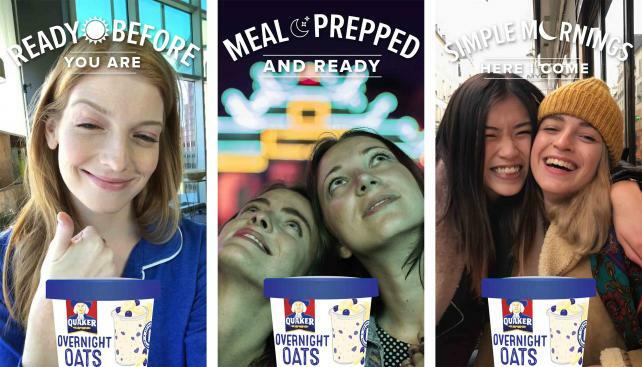 "Geofilters and audience filters have fundamentally different targeting strengths," Abhishek Jadon, director digital strategy at Pepsi North America Nutrition, the parent company of Quaker Oats, wrote in an email to AdAge. "Geofilters allow you to target very granular geographic areas, whereas audience filters can be targeted based on a host of behavioral attributes." The filters advertisements now have the same targeting tools as Snapchat's video ads, and they can both be bought in auctions on the self-serve platform. "When you consider the earned impressions derived from Snapchatters sending out Snaps using the filters to their friends, in addition to the paid delivery costs, the effective CPMs paid can be extremely efficient,” Jon Morgenstern, VP of paid media, at VaynerMedia, said in an e-mail to AdAge. The platform recently upgraded its ads manager with an advanced mode that is similar to Facebook's Power Editor. Now businesses can design, test and publish ads in a more streamlined fashion on Snapchat. And while there is still plenty of catching up to do, Snapchat is definitely picking up steam in the advertising department. It’s especially important for your property to not just exist and have an active presence on Snapchat, but to take advantage of the advertising opportunities available on the the platform. As we’ve discussed in previous articles, Snapchat presents many opportunities to showcase your property in a fun, engaging light. Targeting potential residents down to their interests, age and even the time of day they may be scrolling can help you reach qualified leads to fill vacant units.